Professional Demolition | Abbotts’ Construction Services, Inc. While you may be tempted to take on your home’s demolition job yourself, it isn’t a safe thing to do. Find out how using a professional crew can protect you. A variety of equipment will be used in the demolition of your home. While you can use a sledge hammer and jackhammer to pick apart your home, this job can be dangerous and time consuming. Professionals, on the other hand, have an educated understanding of weight-bearing walls and other areas of concern that prevents injuries. Professionals also use more efficient equipment to demolish your home. A demolition crew will have access to equipment such as bobcat, which significantly cuts down on the demolition time. The crew will already be experienced with using this equipment as well. Your home can contain a variety of hazardous materials you aren’t aware of. Exposure to those materials can adversely affect your health and well-being. 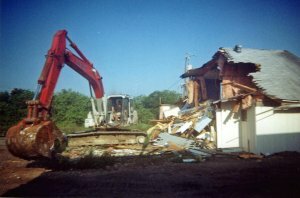 Professional demolition crews know how to demolish a home while properly protecting themselves from the hazardous materials. Asbestos is one material that can be hazardous to your health. While newer homes are constructed without the use of asbestos, almost all Florida homes built prior to the 1980s were built with the use of asbestos. Some areas of homes that can contain asbestos include the flooring, roofing, ceiling, plaster, insulation, and walls. Breathing in asbestos can lead to the development of asbestosis, lung cancer, and mesothelioma. While prolonged exposure to asbestos increases your risks of developing one of these health problems, any exposure is not good. During the demolition process, the fibers will make their way in the air where you will inhale them. The fibers will also get on your clothing. In addition, rodent feces and bat guano are often found in attics and other locations throughout a home. When demolishing a home, the feces and guano will be stirred up, and particles will go into the air you breathe. Breathing in rodent feces can lead to the development of hantavirus pulmonary syndrome (HPS). Hantavirus pulmonary syndrome can cause fever, muscle pain, and fatigue. This infection can be fatal. Breathing in the stirred-up dust from bat guano can lead to a condition called histoplasmosis. Histoplasmosis can cause flu-like symptoms and in many cases will go away on its own. However, in some people, histoplasmosis will lead to long-term illness and it can be fatal. Another demolition-related risk is tetanus — a bacterial disease a person can get when their skin is punctured by a sharp object that has the tetanus bacteria on its surface. Getting cut on metal, such as a nail, is one of the ways a person can get tetanus during a home demolition job. Tetanus causes painful muscle contractions, lockjaw, breathing difficulties, swallowing difficulties, and fever, and it can be fatal. While tetanus shots can prevent a person from getting tetanus, a person must have had a booster shot in the past 10 years to be protected. Before demolishing your house, you will need to properly shut off or cap all the systems in it. Not properly doing so can lead to serious injuries and even death. Also, you need to notify the proper utility companies ahead of time. A professional demolition crew knows how to prepare these systems for demolition. If you need your home demolished, contact us now. We will demolish your home for you so you can focus on the preparing for next steps you have planned for your property.